Innovation and the pace of change has never been faster in the foodservice and hospitality sector. Consumer tastes shift quickly with well-being, street food and snacking habits changing the way we approach food on a day-to-day basis. Larger macro trends such as food waste also play a huge role in how we approach food from farm to fork. Technology has a huge role to play as well. From 3D printed cheeseburgers to disruptive delivery platforms and AI led vertical farming, new innovations are fundamentally changing the way we look at food. Great ideas come from a myriad of sources, and we all need some inspiration sometimes. So with that in mind we’ve collected some of the best TED talks from world renowned speakers that challenge us to rethink the way we look at food. If you've been in a restaurant kitchen, you've seen how much food, water and energy can be wasted there. Chef Arthur Potts-Dawson shares his very personal vision for drastically reducing restaurant, and supermarket, waste — creating recycling, composting, sustainable engines for good (and good food). Winnow CEO and co-founder Marc Zones has worked in food for his entire life.He wants us to realize that food is way too valuable to waste. He strongly believes that the combination of technology and entrepreneurship can create extraordinary opportunities to change the way how we make food and solve the problem of food waste. Western countries throw out nearly half of their food, not because it’s inedible — but because it doesn’t look appealing. Tristram Stuart delves into the shocking data of food waste, calling for a more responsible use of global resources. Feeling inspired? 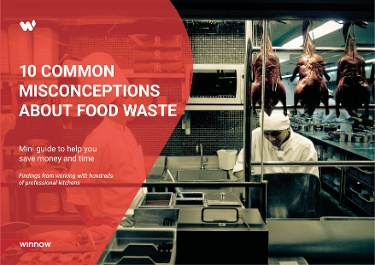 Find out how new technology can transform the way your business look at food waste. Watch our case study video shot with Accor hotels where Winnow’s technology helped cut food waste in half. Watch on demand here.